We were staying at a bed and breakfast in the Hamptons during the week between Christmas and New Year and, one rainy evening, we ducked into a little restaurant in town. 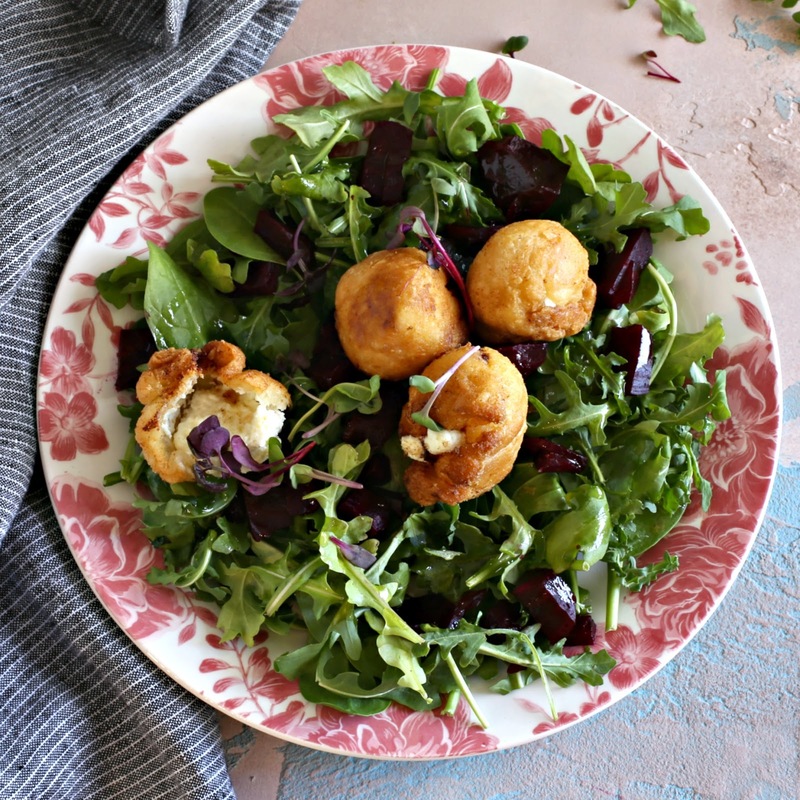 The first thing on the menu that caught our eye was a salad with crispy goat cheese dumplings. We couldn't quite picture what those would be but, when it comes to goat cheese, we didn't need much convincing. What arrived was probably one of the best little bites I'd ever had. 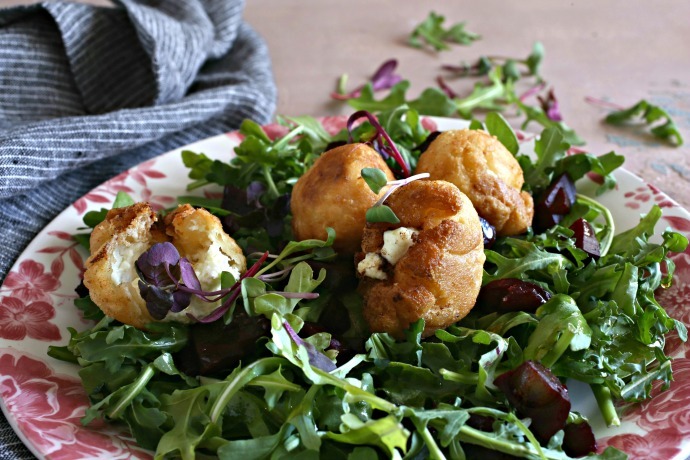 Crispy, crunchy little dough pockets filled with tangy goat cheese over a bed of greens. I knew I had to find out how to make them but then life got in the way, time passed, other recipes were created, etc. Until a couple of weeks ago, that is, when I came across a review of that restaurant and someone posted a photo of that salad. So much time had passed that I couldn't even remember what kind of dough was used but the photo looked like it was a won ton wrapper. I didn't have a recipe but began playing around with it. No luck. I couldn't quite get there. So I decided to switch to my homemade savory pastry dough and that worked great. So, these might not taste like the ones in the restaurant but they're still pretty heavenly. Enjoy! 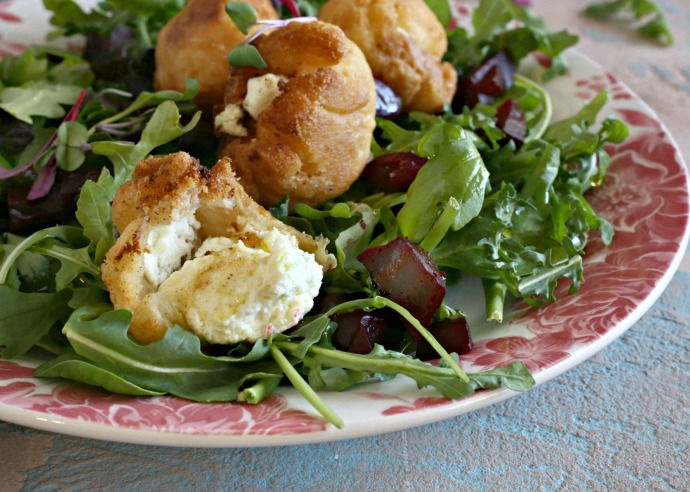 Recipe for crispy goat cheese filled dough puffs served over salad. To make the dough, combine the flour and salt in a large bowl. Cut in the butter using a fork or pastry cutter. You can also grate the butter on the large side of a box grater. Gently work the butter into the flour to make sure it's coated. Add in the ice water and form into a dough ball. Cover with plastic wrap and refrigerate for about an hour. Roll 1/2 oz. balls of the goat cheese and freeze while the dough is chilling. Roll the dough out on a well floured surface until it is quite thin. Cut into rounds and wrap around the frozen goat cheese. Make sure they are well sealed. Heat the oil to 350 degrees and fry the balls for a minute or two on each side, turning as needed. 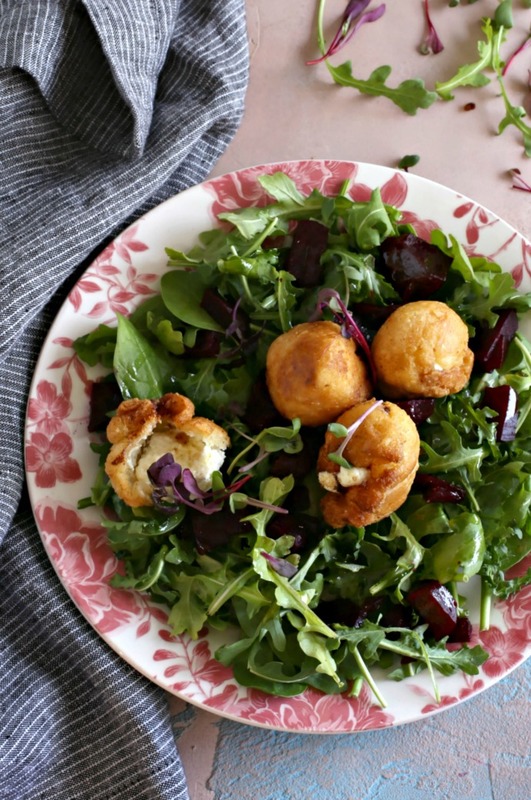 Transfer them to a paper towel lined plate to drain and serve warm over your favorite salad. Who needs wonton wrappers anyhow; these sound better to me! If it wasn't after 7pm I might have made these for dinner with a salad on the side. Soon though; I have two blocks of goat cheese crying for a recipe.